Japan’s economy is in trouble. The latest GDP figures show that it’s currently (and unexpectedly) in recession. 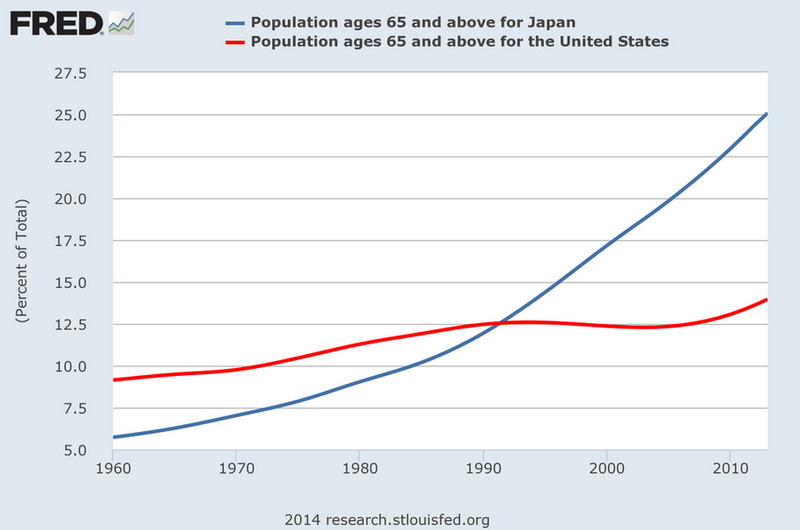 In the long term, this is largely a story about demographics, and Japan is fighting an uphill battle. 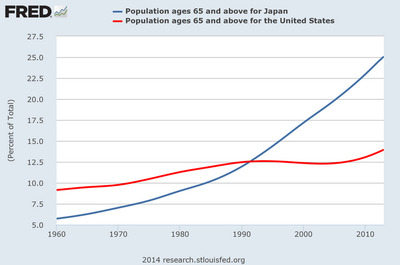 Currently, 25% of Japan’s population is over the age of 65, and that number isn’t going down anytime soon. That means a shrinking percentage of the population is working. Meanwhile, a growing percentage of the population is receiving benefits, living on a fixed income, and being supported by that shrinking population of workers. Unfortunately, no amount of loose monetary or fiscal policy will generate create more working age people overnight. With the bulge of Baby Boomers on the brink of retirement, some fear the US faces the same threat. However, the chart above shows just how big the difference is between the two countries.